Sunday I took an early morning photography class at Paradise Pond, and then left for the airport to catch 6:00 PM flight. Of course this left about eight hours to kill in between, and I planned to use it visiting some more inland hotspots. I mostly followed the route outlined in Cooksey and Weeks’ Birder’s Guide to the Texas Coast , starting from Oso Creek Park. After the Botanic Gardens, I followed a route that took me to some unlikely local hotspots in industrial areas and small local parks. Among other birds, I added Least Sandpiper, Stilt Sandpiper, and American Avocet to the trip list. However the real jewel was the final stop at a small park at the Hilltop Community Center. I don’t know why this is such a hot spot, but it was just popping with new and interesting birds. There were several I hadn’t found earlier on the trip including Ruby-crowned Kinglet and White-winged Dove. The area wasn’t that great–just about 30 acres–but the foliage was very dense with lots of cover, no open fields, so you had to walk all the trails. The first “lifer” I found was a surprised Javelina (Pecari tajacu), a local native wild pig. It ran off before I could get a good shot. I may have seen one earlier at Lake Findley on the first day, but that one was too far away to be sure. 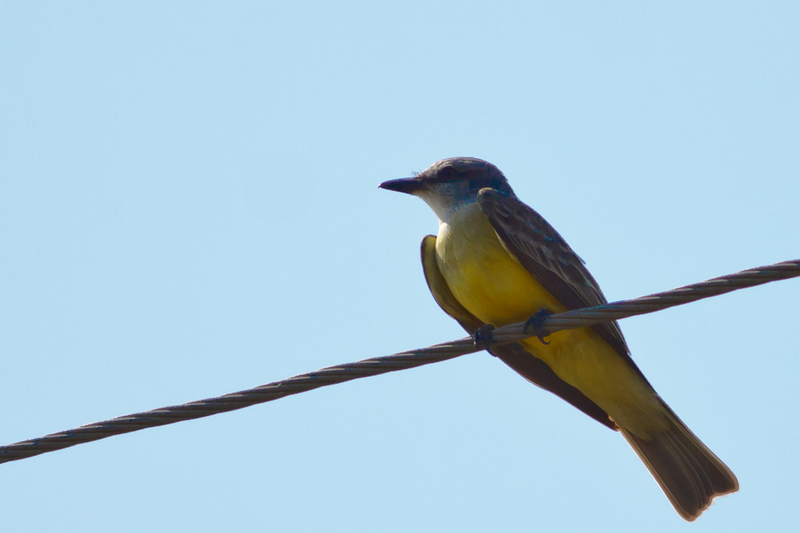 This one was much more cooperative, and gave me plenty of time to shoot it from all angles, and carefully check the field marks against my Sibley Field Guide to make sure it wasn’t the very similar (but much rarer) Tropical Kingbird. Saturday I was up even earlier to catch a 6:00 A.M. bus to Fennessey Ranch. 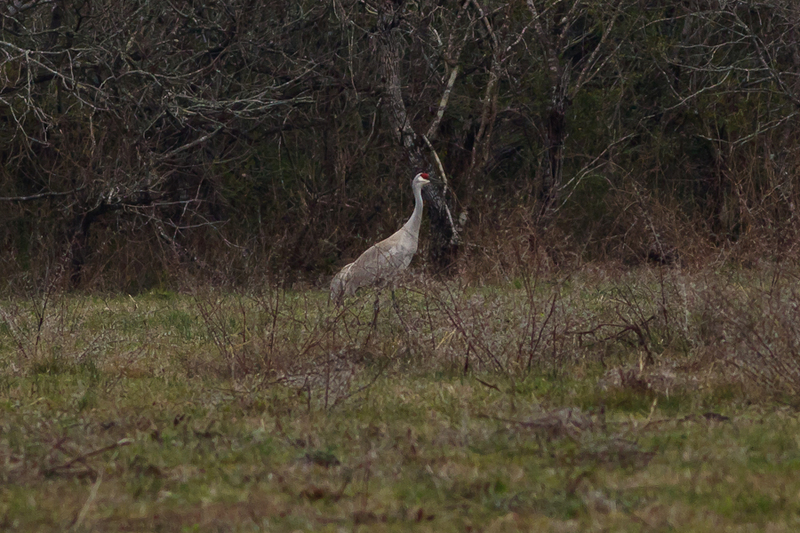 Amusing that I got my life Whooping Crane before the much more common Sandhill Crane. Friday I got up bright and early for the real highlight of the trip: a boat ride through the Aransas National Wildlife Refuge to to find Whopping Cranes. When I awoke Port A. was covered in fog, and driving to the dock was a little tricky. (I got lost twice.) By the time I found it, the fog was still pretty thick. I could see a raptor on top of a nearby telephone pole, but could at best guess it was some kind of Buteo, probably a Red-tailed Hawk but I’m not sure. 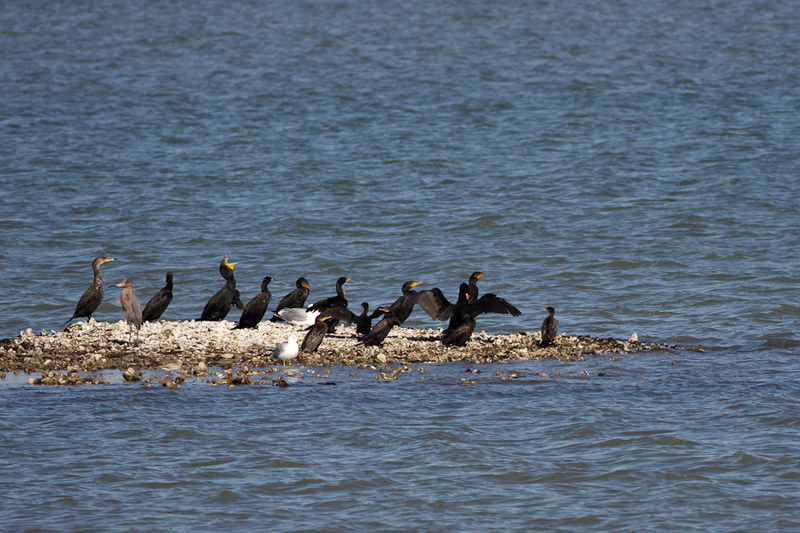 Similarly I could only guess that the cormorant across the harbor was a Double-crested. I noticed some of my fellow passengers had tripods and scopes. I’ve never brought a tripod on a boat before, but after checking with them, they seemed to think it would be possible to use, so I grabbed mine out of the rental car. Fortunately I hadn’t left it in my hotel room. Thursday morning we woke up in the bunkhouse and saw that weather was cloudy so we didn’t race too fast to get out to the blind. once we did get moving, the first stop was another set of buildings little ways down the road where we parked our cars before looking for a Barn Owl. However, as soon as we got out of the cars, I heard what I thought was a Red-bellied Woodpecker so I walked behind the buildings check it out. I didn’t initially find the putative Red-bellied woodpecker. Instead, the first woodpecker I saw was a Ladder-backed Woodpecker. Much better, since we have Red-bellied Woodpeckers back in New York, but I’ve never seen a Ladder-backed Woodpecker. 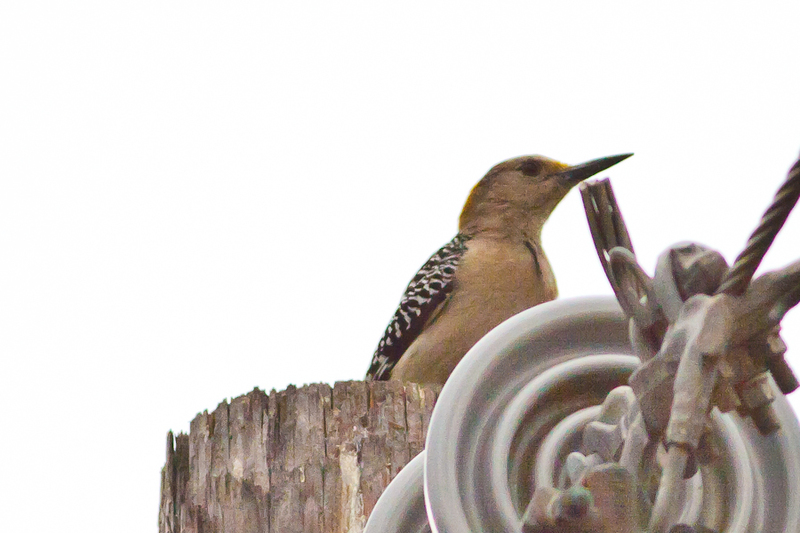 Ladder-backed Woodpeckers are mostly mid-country birds that don’t reach either coast. One hung out for a while in Irvine Regional Park when I moved to California in 2008, but life was a little too hectic then to chase it. This one flew off very quickly before I could get a photo, but that still counts as life bird number 521. Update: Turns out it doesn’t. Checking my notes I see I did have a Ladder-backed Woodpecker at Covington Park in Morongo Valley in California in 2008. A couple of weeks ago my human resources department sent me an e-mail warning me that I was about to max out on accrued vacation days so I had to use some fast. I looked around for the next available birding festival, and the most interesting one seemed to be the Whooping Crane Festival in Port Aransas. I also considered Winter Wings in Oregon, but it offered mostly the same birds I’d already found in California. 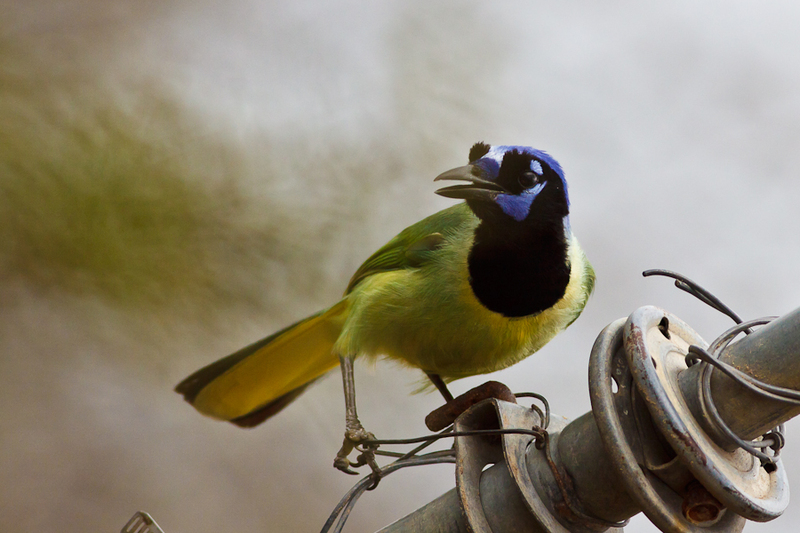 Texas, by contrast, has dozens of species I’ve never seen and that can’t be found anywhere else in the United States. Thus Wednesday I flew into Corpus Christi Airport for five days of semi-intense South Texas birding. 2010 was the first complete calendar year in which I was both a Zipcar member and in New York the entire year. How’d it work out? You are currently browsing the Mokka mit Schlag weblog archives for February, 2011.